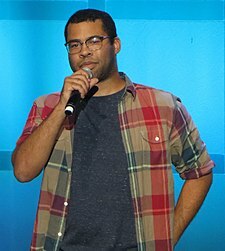 Jordan Haworth Peele (born February 21, 1979) is an American actor, comedian, and filmmaker. He is best known for his film and television work in the comedy and horror genres. Peele's breakout role came in 2003, when he was hired as a cast member on the FOX sketch comedy series Mad TV, where he spent five seasons, leaving the show in 2008. In the following years, he and his frequent Mad TV collaborator, Keegan-Michael Key, created and starred in their own Comedy Central sketch comedy series Key & Peele (2012–2015). In 2014, they recurred together playing FBI agents in season one of FX's anthology series Fargo. He co-created the TBS comedy series The Last O.G. (2018–present) and the YouTube Premium comedy series Weird City (2019–present). He has also served as the host and producer of the CBS All Access anthology series The Twilight Zone (2019–present). In film, Peele co-wrote and starred in Keanu (2016), and has provided his voice to the animated films Storks (2016) and Toy Story 4 (2019). His 2017 directorial debut, the horror film Get Out, was a critical and box office success. He received numerous accolades, including the Academy Award for Best Original Screenplay, along with nominations for Best Picture and Best Director. He received his second Academy Award nomination for Best Picture for producing Spike Lee's BlacKkKlansman (2018). He then directed, wrote, and produced the acclaimed horror film Us (2019). Peele was born in New York City, the son of Lucinda Williams and Hayward Peele, and was raised by his single mother on Manhattan's Upper West Side. His mother is white, and his father is black. He attended the Computer School in Manhattan, graduated from The Calhoun School on Manhattan's Upper West Side, and went on to Sarah Lawrence College. After two years, Peele dropped out to form a comedy duo with his college roommate and future Key & Peele comedy writer Rebecca Drysdale. Peele regularly performed at Boom Chicago in Amsterdam and The Second City in Chicago. He and Nicole Parker were well known for their musical duets at Boom Chicago. He portrayed a popular character called "Danish Supermodel Ute" during his time at Boom Chicago and hosted MTV's Comedy Weekend in 2002. In 2003, Peele joined the cast of Mad TV for its ninth season. Around the time Keegan-Michael Key joined the cast as a featured performer, it was assumed that Key would be chosen over Peele. The two of them ultimately were cast together after showing great comedic chemistry. Peele performed celebrity impersonations, which included favorites Caroll Spinney (as the voice of Big Bird from Sesame Street), Ja Rule, James Brown, Flavor Flav, Justin Guarini, Montel Williams, Morgan Freeman, Timbaland, and Forest Whitaker. Peele was absent from the first four episodes of his second season on Mad TV. He made a cameo in "Weird Al" Yankovic's video "White & Nerdy" with Mad TV co-star Keegan-Michael Key. Peele was nominated for a 2008 Emmy Award for his song "Sad Fitty Cent", a music video parody about 50 Cent lamenting over his rivalry with Kanye West. The lyrics were, according to the music video, written by Peele, and he was involved in arranging its music. In 2009 he appeared in Little Fockers. Peele appeared in a viral video titled "Hillary vs Obama" (which was shown as a Mad TV sketch) where he and a Hillary Clinton supporter (played by short-term cast member Lisa Donovan) argue over whether Hillary Clinton or Barack Obama would make a better president, only to get upstaged by a Rudy Giuliani supporter (played by Donovan's brother, Ben). Peele auditioned to be a castmember for Saturday Night Live when SNL producers were looking for someone to play Barack Obama (around the time when SNL and Mad TV — and other scripted shows — were put on hiatus due to the 2007–2008 Writers Guild of America strike). Peele remained at Mad TV and the role went to Fred Armisen until September 2012, when Jay Pharoah took over the role. After five seasons on Mad TV, Peele left the cast at the end of the 13th season. In 2010, Peele co-starred in the FOX comedy pilot The Station, and appeared with a recurring role in the Adult Swim series Childrens Hospital. He had a supporting role in the David Wain-directed comedy Wanderlust, which was released in 2012. Peele and his former Mad TV castmate and friend Keegan-Michael Key starred in their own Comedy Central sketch series Key & Peele, from 2012 to 2015. The series was a success with viewers, and spawned several skits and videos that went viral online. In 2014, Peele played an FBI agent in the first season of the FX anthology series Fargo, based on the 1996 film of the same name. In 2016, Peele starred in and produced, with Key, the first feature film in which the two both had leading roles, Keanu (they had previously both appeared in Wanderlust). The film received generally favorable reviews from critics. 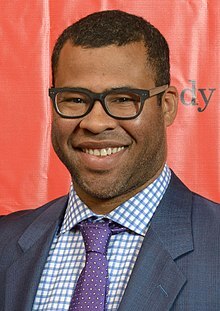 In February 2017, Peele's first film as solo director, Get Out, was released to critical acclaim, eventually scoring a 99% rating on Rotten Tomatoes. The film received particular praise for Peele's screenplay and direction, as well as the performance of its lead, Daniel Kaluuya, and was chosen by the National Board of Review, the American Film Institute, and Time magazine as one of the top 10 films of the year. The Atlantic called the film "a masterpiece." Get Out proved to be popular with movie audiences, and it eventually became one of the most profitable horror films, and films of 2017, and grossed over $255 million on a budget of $4.5 million. For his work on the film, Peele received significant attention, as well as numerous accolades, including the Bingham Ray Breakthrough Director Award at the 2017 Gotham Independent Film Awards. The film also received four nominations at the 90th Academy Awards: Best Picture, Best Director and Best Original Screenplay nominations for Peele, as well as a Best Actor nomination for Kaluuya. Peele won the Academy Award for Best Original Screenplay, becoming the first black screenwriter to win in this category. He became the third person, after Warren Beatty and James L. Brooks, to be nominated for Best Picture, Best Director, and Best Original Screenplay for a debut film, and the first black person to receive them for any one film. Get Out also earned him the Writers Guild of America Award for Best Original Screenplay, as well as nominations for a Directors Guild of America Award and a BAFTA Award for Best Original Screenplay. In early 2018 Peele announced his intention to retire from acting, stating in an interview with CBS "Acting is just nowhere near as fun for me as directing". In 2018, Peele co-created the TBS comedy series The Last O.G., starring Tracy Morgan and Tiffany Haddish. Also in 2018, Peele co-produced the Spike Lee film, BlacKkKlansman which was released to critical acclaim and was a box office success. The film received six nominations at the 91st Academy Awards including the Best Picture nomination for Peele. On June 28, 2018, it was announced that YouTube Premium will release Weird City, which is co-created by Peele and Charlie Sanders. The show was released in February 13, 2019 to critical acclaim. On April 5, 2018, it was announced that Amazon Video had given a series order to the docuseries Lorena consisting of four episodes. The series was set to be directed by Joshua Rofé who would also executive produce alongside Peele, Win Rosenfeld, Steven J. Berger, Jenna Santoianni, and Tom Lesinski. Production companies involved with the series include Monkeypaw Productions, Sonar Entertainment, and Number 19. It ultimately premiered on February 15, 2019. Peele's second film as director was Us, a horror-thriller film which he also wrote and produced, starring Lupita Nyong'o, Winston Duke, Elisabeth Moss, and Tim Heidecker. After having its world premiere on March 8, the film was released in the United States on March 22, 2019 by Universal Pictures, Monkeypaw Productions, and QC Entertainment. Peele developed and is narrator for the science fiction web television series The Twilight Zone, the third revival of the original 1959-64 anthology series that aired on CBS, for CBS All Access. The show premiered on April 1, 2019, with Peele, Simon Kinberg and Marco Ramirez as executive producers. On November 3, 2015, it was reported that Henry Selick is developing Wendell and Wild, a new stop-motion feature with Jordan Peele and Keegan-Michael Key based on an original story by Selick. In March 2018, the film was picked up by Netflix. There have been developments of several films based on Peele's sketch comedy series Key & Peele. In March 2015, it was announced that Key will reprise the role of Mr. Garvey in a feature-length film Substitute Teacher with Peele portraying a rival teacher. In March 2017 in a Reddit AMA, Peele expressed interest in developing a film around his Key & Peele character Wendell Sanders based on the music video "The Power of Wings". The film, titled Wendell Meets Middle-Earth, would follow Wendell's existence in the fantasy world that he likes to see his life in. Peele will produce the HBO series Lovecraft Country written by Underground co-creator Misha Green. In May 2018, Amazon ordered a 10 episode series about hunting down Nazis called The Hunt, which is produced by Peele. In September 2018, it was announced Peele was in talks to produce a remake of Candyman, through his Monkeypaw Productions, of which Candyman star Tony Todd stated in a 2018 interview with Nightmare on Film Street, "I’d rather have him do it, someone with intelligence, who’s going to be thoughtful and dig into the whole racial makeup of who Candyman is and why he existed in the first place." In November 2018, it was confirmed that Peele will produce the film with Universal and MGM and will partner with Win Rosenfeld to co-produce the film, while Nia DaCosta will sign on as director. The new Candyman will serve as a "spiritual sequel", taking place back in the new gentrified Cabrini Green, where the old housing projects development once stood in Chicago. Filming will start in the spring of 2019, and there is no word as of yet who is starring in the film. The theatrical release is set for June 12, 2020. In February 2017, Peele curated the Brooklyn Academy of Music film series "The Art of the Social Thriller", comprising 12 films that inspired the making of Get Out, including the horror films Rosemary's Baby, Night of the Living Dead, The Shining, Candyman, The People Under the Stairs, Scream, The Silence of the Lambs, Funny Games, Misery, and the thrillers Rear Window, The 'Burbs, and the 1967 racial comedy-drama Guess Who's Coming to Dinner. As a comedian, Peele counts among his influences In Living Color, Richard Pryor and Dave Chappelle. Peele began dating Chelsea Peretti in 2013. They became engaged in November 2015, and in April 2016, Peretti announced that she and Peele had eloped. Peretti gave birth to their son Beaumont on July 1, 2017. 2009 Reno 911! Yes No No No Three-Card Monte Guy Episode: "Extradition to Thailand"
2011 Love Bites Yes No No No Eli Episode: "Too Much Information"
2013 The Mindy Project Yes No No No Nick Episode: "Mindy's Minute"
2013 Workaholics Yes No No No Mark Episode: "The Worst Generation"
2013 Comedy Bang! Bang! Yes No No No Tan Fu Episode: "Andy Samberg Wears a Plaid Shirt & Glasses"
2013 Axe Cop Yes No No No Super Axe (voice) Episode: "Super Axe"
2013 Modern Family Yes No No No Derrick Episode: "A Fair to Remember"
2014 Drunk History Yes No No No Percy Julian Episode: "Montgomery, AL"
2015 Rick and Morty Yes No No No Second Fourth-Dimensional Being (voice) Episode: "A Rickle in Time"
2016 The Muppets Yes No No No Himself Episode: "Swine Song"
2016 American Dad! Yes No No No Street Thug (voice) Episode: "Criss-Cross Applesauce: The Ballad of Billy Jesusworth"
2018 The Shivering Truth Yes No No No Various Voices Episode: "Ogled Inklings"
^ Tied with Guillermo del Toro for The Shape of Water. ^ a b c Zadie Smith (February 23, 2015). "Brother from Another Mother". The New Yorker. Retrieved May 9, 2016. ^ "February 21, birthdays for Ellen Page, Corbin Bleu, Jordan Peele". Brooklyn Daily Eagle. February 21, 2017. Retrieved July 17, 2017. ^ a b "Keegan-Michael Key and Jordan Peele on Fargo and Wanting Michael Winslow for Their Police Academy Reboot". Vulture. June 3, 2014. Retrieved December 27, 2017. ^ a b "'Get Out' Is Now Officially The Most Profitable Film Of 2017". Vibe. August 6, 2017. Retrieved December 27, 2017. ^ "Jordan Peele Biography". TVGuide.com. Retrieved July 17, 2017. ^ Wolcott, James (October 13, 2014). "How Keegan-Michael Key and Jordan Peele Have Broken the Comedy-Duo Mold". Vanity Fair. Retrieved 4 January 2015. ^ "COMEDY CENTRAL® Greenlights Two New Series for the 2012 Season - an Untitled Sketch Comedy From Keegan-Michael Key and Jordan Peele and "The Nick Show Kroll" Starring Nick Kroll" (Press release). New York, New York. PR Newswire. June 29, 2011. ^ TV.com. "Key & Peele". TV.com. Retrieved December 27, 2017. ^ Smith, Zadie (February 16, 2015). "Key and Peele's Comedy Partnership". The New Yorker. ISSN 0028-792X. Retrieved December 27, 2017. ^ "How Key & Peele Make Comedy That Goes Really, Insanely Viral". BuzzFeed. Retrieved December 27, 2017. ^ McNary, Dave (April 28, 2016). "Jordan Peele on 'Keanu': 'It Looks Like Michael Mann Made a Comedy'". Variety. Retrieved December 27, 2017. ^ "Why this new horror movie has a rare perfect score from critics — and you need to see it". Business Insider. Retrieved December 25, 2017. ^ Sims, David. "What Made That Hypnosis Scene in 'Get Out' So Terrifying". The Atlantic. Retrieved December 27, 2017. ^ "Jordan Peele's 'Get Out' Is the Most Profitable Film of 2017". Money. Retrieved December 27, 2017. ^ Muncy, Julie. "Watch Jordan Peele Respond to Some Great Get Out Fan Theories". io9. Retrieved December 27, 2017. ^ a b Buckley, Cara (November 28, 2017). "'Call Me by Your Name,' 'Get Out' Win Big at Muted Gotham Awards". The New York Times. ISSN 0362-4331. Retrieved December 27, 2017. ^ McNary, Dave. "'Get Out' Scores Four Oscar Nominations, Including Three for Jordan Peele". Variety. Retrieved February 22, 2018. ^ Merry, Stephanie; Izadi, Elahe; Rao, Sonia; Yahr, Emily (March 4, 2018). "Oscars 2018: 'The Shape of Water' wins best picture; Frances McDormand's rousing speech; Jordan Peele makes history with 'Get Out' screenplay". Washington Post. ISSN 0190-8286. Retrieved March 5, 2018. ^ Lexy Perez (March 4, 2018). "Oscars: Jordan Peele Wins Best Original Screenplay for 'Get Out'". The Hollywood Reporter. Retrieved March 5, 2018. ^ Gonzalez, Sandra. "Jordan Peele is first black screenwriter to win best original screenplay". CNN. Retrieved March 5, 2018. ^ Lawrence, Derek. "Jordan Peele says he's done with acting: 'Daniel Day-Lewis and I are both out'". Entertainment Weekly. Retrieved February 22, 2018. ^ Holloway, Daniel (3 April 2018). "Tracy Morgan and Jordan Peele on Why 'The Last O.G.' Isn't Morgan's Comeback". variety.com. ^ Otterson, Joe (April 5, 2018). "Jordan Peele to Produce Lorena Bobbitt Docuseries for Amazon". Variety. Retrieved April 5, 2018. ^ O'Connell, Michael (April 5, 2018). "Jordan Peele Is Making a Lorena Bobbitt Docuseries for Amazon". The Hollywood Reporter. Retrieved April 5, 2018. ^ Maglio, Tony (April 5, 2018). "Jordan Peele Docuseries on Lorena Bobbitt Headed to Amazon". The Wrap. Retrieved April 5, 2018. ^ Hibberd, James (April 5, 2018). "Jordan Peele to tackle Lorena Bobbitt scandal in Amazon series". Entertainment Weekly. Retrieved April 5, 2018. ^ Kroll, Justin (9 May 2018). "Jordan Peele Reveals Title of Next Film; Lupita Nyong'o, Elisabeth Moss Eyed to Star (EXCLUSIVE)". variety.com. ^ Andreeva, Nellie (December 6, 2017). "'The Twilight Zone': Jordan Peele, Simon Kinberg & Marco Ramirez Board Reboot On CBS All Access". Deadline Hollywood. Retrieved August 22, 2018. ^ Flores, Terry (3 November 2015). "Henry Selick, Key & Peele Developing Animated Feature 'Wendell and Wild' (EXCLUSIVE)". Variety. ^ Mike Fleming Jr. "Netflix Wins Stop-Motion Animated 'Wendell And Wild': Henry Selick, Jordan Peele, Keegan-Michael Key Aboard". ^ Fleming Jr, Mike. "Paramount To Turn Key & Peele's 'Substitute Teacher' Into Feature; Keegan-Michael Key And Jordan Peele To Star". Deadline Hollywood. Archived from the original on April 29, 2015. Retrieved 26 April 2015. ^ Mike Flemming Jr. "'Get Out's Jordan Peele Teams With WBTV, HBO & Bad Robot For 'Lovecraft Country' Drama Series; Misha Green Writing". Deadline. Retrieved May 16, 2017. ^ Jennifer Maas (May 17, 2018). "Amazon Orders Jordan Peele's Nazi-Hunting Show to Series". The Wrap. Retrieved December 7, 2018. ^ Otterson, Joe (May 17, 2018). "Jordan Peele-Produced Nazi Hunter Drama Ordered to Series at Amazon". Variety. Retrieved May 17, 2018. ^ Jarvey, Natalie (May 17, 2018). "Jordan Peele Nazi Drama Picked Up to Series at Amazon". The Hollywood Reporter. Retrieved May 17, 2018. ^ "Jordan Peele in Talks to Remake Clive Barker's 'Candyman' [Exclusive] - Bloody Disgusting". bloody-disgusting.com. Retrieved 2018-10-03. ^ "[Exclusive Interview] Horror Icon Tony Todd Talks HELL FEST and Gives His Blessing To CANDYMAN Remake | Nightmare on Film Street - Horror Movie Podcast, News and Reviews". Nightmare on Film Street - Horror Movie Podcast, News and Reviews. 2018-09-26. Retrieved 2018-10-03. ^ "Jordan Peele-Produced 'Candyman' Reboot Taps Director Nia DaCosta". Variety. 2018-11-27. Retrieved 2018-11-27. ^ "Jordan Peele to co-write sequel to horror film 'Candyman'". EW.com. Retrieved 2018-11-30. ^ "Jordan Peele: The Art of the Social Thriller". Brooklyn Academy of Music. February 17 – March 1, 2017. Archived from the original on March 10, 2017. Retrieved August 13, 2017. ^ "Andy Samberg's Latest Role Is Playing Cupid!". dishnation.com. September 2, 2014. Retrieved November 24, 2014. ^ Adams, Char (November 29, 2015). "Jordan Peele and Chelsea Peretti Announce Engagement on Twitter". People. ^ "Surprise! Chelsea Peretti and Jordan Peele Eloped". People. April 26, 2016. Retrieved April 26, 2016. ^ "Jordan Peele and Chelsea Peretti Welcome Their First Child". Retrieved July 18, 2017. ^ McDonald, Andy (December 4, 2017). "Jordan Peele Responding To 'Get Out' Fan Theories Is As Funny As You'd Expect". HuffPost. Retrieved December 14, 2017. ^ Corey, Sarah Halle (March 21, 2019). "Jordan Peele's Cameos in 'Get Out' & 'Us' Are So Low Key, You Need To Watch Carefully". Elite Daily. Retrieved March 23, 2019. ^ a b c Barnes, Brooks (January 23, 2018). "2018 Oscar Nominations: 'The Shape of Water' Leads With 13 Nominations". New York Times. Archived from the original on January 23, 2018. Retrieved January 23, 2018. ^ Melas, Chloe (February 24, 2019). "Oscars winners 2019: See the full list of winners". CNN. Archived from the original on February 25, 2019. Retrieved February 24, 2019. ^ "Complete List of Nominees for 2008 Emmys". E!. July 17, 2008. Retrieved September 27, 2014. ^ a b c d "Emmy Awards: The Complete Winners List". The Hollywood Reporter. September 20, 2015. Retrieved September 23, 2015. ^ a b Lewis, Dave (July 14, 2016). "Nominations for the 68th Primetime Emmy Awards". Los Angeles Times. Retrieved July 14, 2016. ^ Ritman, Alex (January 8, 2018). "BAFTA Awards: 'Shape of Water,' 'Three Billboards,' 'Darkest Hour' Lead Pack of Nominations". The Hollywood Reporter. Retrieved January 8, 2018. ^ Pond, Steve (10 February 2019). "BAFTA Awards 2019: 'The Favourite' Dominates, But 'Roma' Wins the Big One". The Wrap. Retrieved 10 February 2019. ^ "'The Big Short' and 'Spotlight' Win Writers Guild Awards: Complete Winners List". TheWrap. February 13, 2016. Retrieved February 27, 2016. ^ Lewis, Hilary (January 4, 2018). "WGA Awards: 'Get Out,' 'Logan,' 'The Big Sick' Among Film Nominations". The Hollywood Reporter. Retrieved January 4, 2018. ^ a b Hammond, Pete (January 11, 2018). "DGA Awards Nominees: 'Shape Of Water', 'Lady Bird', 'Dunkirk', 'Three Billboards', 'Get Out'". Deadline Hollywood. Retrieved January 19, 2018. ^ Pedersen, Erik (January 5, 2018). "PGA Awards Film & TV Nominations Unveiled". Deadline.com. Retrieved January 5, 2018. ^ McNary, Dave (January 4, 2019). "Producers Guild Awards Nominees Include 'Black Panther,' 'A Star Is Born,' 'Vice'". Variety. Retrieved January 4, 2019. ^ "The Peabody Awards". Peabody Awards. Archived from the original on May 8, 2016. Retrieved May 9, 2016. ^ Couch, Aaron; Washington, Arlene (February 22, 2014). "NAACP Image Awards: The Winners". The Hollywood Reporter. Archived from the original on March 13, 2016. Retrieved February 22, 2014. ^ "Amy Poehler, Seth Rogen win American Comedy Awards". Entertainment Weekly. May 9, 2014. Archived from the original on October 6, 2014. Retrieved September 26, 2014. ^ Toomey, Alyssa (November 4, 2014). "Jennifer Lawrence, Shailene Woodley and Robert Downey Jr. Among People's Choice Nominees, Plus Find Out Who's Hosting!". E! Online. Archived from the original on January 14, 2017. Retrieved November 8, 2014. ^ Jue, Teresa (December 9, 2014). "NAACP Image Awards announce nominations for film and TV". Entertainment Weekly. Archived from the original on December 11, 2014. Retrieved December 11, 2014. ^ "'Creed,' 'Empire' Top NAACP Image Award Nominations; Full List". The Hollywood Reporter. February 4, 2016. Archived from the original on March 9, 2016. Retrieved February 27, 2016. ^ Bell, Crystal (April 8, 2017). "HERE ARE YOUR 2017 MTV MOVIE & TV AWARDS NOMINATIONS: SEE THE FULL LIST". MTV. Retrieved December 9, 2017. ^ Vulpo, Mike (June 25, 2017). "BET Awards 2017 Winners: The Complete List". E!. Retrieved December 9, 2017. ^ D'Alessandro, Anthony (October 19, 2017). "'Get Out' Tops IFP Gotham Awards Nominations; 'Mudbound' Voted Special Jury Award". Deadline Hollywood. Retrieved December 9, 2017. ^ Tartaglione, Nancy (November 1, 2017). "'Lady Macbeth' Leads British Independent Film Awards Nominations – Full List". Deadline Hollywood. Retrieved December 9, 2017. ^ Nordyke, Kimberly (December 10, 2017). "'The Florida Project,' 'Mudbound' Voted Best Picture by New York Film Critics Online". The Hollywood Reporter. Retrieved December 12, 2017. ^ Neglia, Matt (December 8, 2017). "The 2017 San Francisco Film Critics Circle (SFFCC) Nominations". Next Best Picture. Retrieved December 9, 2017. ^ Vlessing, Etan (December 10, 2017). "'The Florida Project' Named Best Film by Toronto Film Critics". The Hollywood Reporter. Retrieved December 12, 2017. ^ Murray, Rebecca (December 9, 2017). "San Diego Film Critics 2017 Nominees: 'Three Billboards,' 'Shape of Water,' and 'Dunkirk' Top the List". Showbiz Junkies. Retrieved December 9, 2017. ^ ""Lady Bird," "Call Me By Your Name" win big for Chicago film critics". Chicago Film Critics Association. Retrieved December 13, 2017. ^ Jorgenson, Todd (December 13, 2017). "DFW Film Critics Name 'The Shape of Water' Best Picture of 2017". Dallas–Fort Worth Film Critics Association. Retrieved December 13, 2017. ^ "2017 StLFCA Annual Award Nominees". St. Louis Film Critics Association. December 11, 2017. Archived from the original on December 12, 2017. Retrieved December 12, 2017. ^ "'The Shape of Water' Leads 2017 Florida Film Critics Awards Nominations". Florida Film Critics Circle. Retrieved December 21, 2017. ^ "The full list of winners of the Golden Globes 2018". The Guardian. January 7, 2018. Retrieved January 8, 2018. Wikimedia Commons has media related to Jordan Peele.